The White City. Boromir thought of it almost every waking moment now. He had seen many wonders on his travels, but nothing compared to its beauty. The sight of the sunlight glistening on the Tower of Ecthelion never failed to stir his heart. Over the centuries, so much of the splendour of Númenor had crumbled to dust or been despoiled by their enemies, but Minas Tirith remained, as unbowed as the valiant men who defended her; men willing to shed their last drop of blood for this proud Queen of cities. Boromir closed his eyes and imagined his return home. 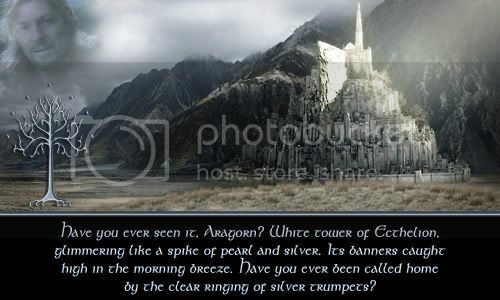 The silver trumpets would sound and the banners flutter in the breeze as he rode through the City gates. His father would hail him as Gondor’s saviour, the lines of care forever banished from his face, when he learned that he had brought the mighty weapon that would save them all. His brother would embrace him with love and pride. Minas Tirith would blossom and flourish as in the days of old. Maybe they would even make him king! Aragorn’s voice broke his reverie. Frodo looked troubled as he wandered away from the group. A sudden fear seized Boromir. What if the Ringbearer chose wrongly? He was but a simple Halfling. What if he chose to take the Ring to Mordor instead? Such folly would be the ruin of them all! What chance of success would he have? The Dark Lord would most surely capture Frodo, and with him, all hopes of saving Boromir’s beautiful City from being laid waste by Sauron’s foul minions. He must make Frodo see reason. He must! Visions of Minas Tirith in ruins swam before his eyes. Boromir rose and went in search of Frodo.